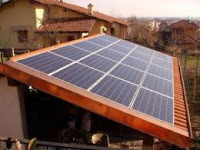 A rooftop solar panel converts sunlight to electricity. In a new study, an expert describes progress toward an efficient and inexpensive method for storing and distributing solar energy in the home. Credit: Wikimedia Commons. New scientific discoveries are moving society toward the era of "personalized solar energy," in which the focus of electricity production shifts from huge central generating stations to individuals in their own homes and communities. That's the topic of a report by an international expert on solar energy published in the ACS' Inorganic Chemistry. It describes a long-awaited, inexpensive method for solar energy storage that could help power homes and plug-in cars in the future while helping keep the environment clean.